British Airways has unveiled digital billboards which will ‘interact’ with aircrafts flying overhead, as the brand looks to remind customers how magical flying can be, from the perspective of children. 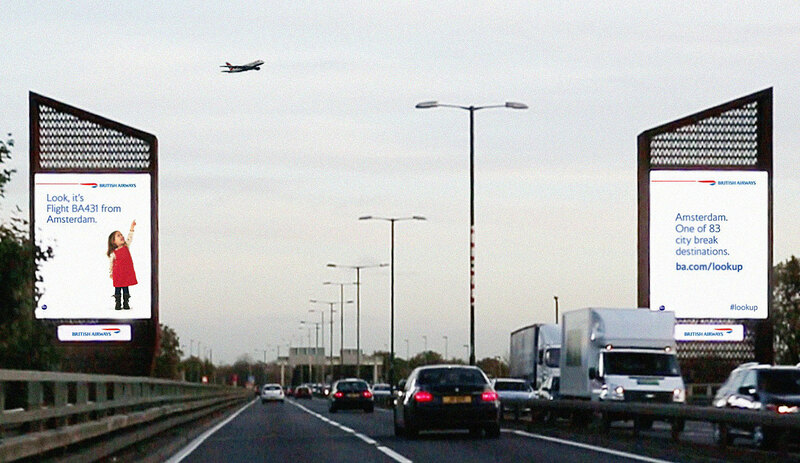 Developed by Ogilvy 12th Floor, the ads use custom built surveillance technology which tracks the aircraft and interrupts the digital display just as it passes over the site, revealing the image of a child pointing at the plane overhead accompanied by its flight number and destination it’s arriving from. This will be accompanied by a relevant message to the flight, such as ‘Fly the new A380 to Los Angeles. ba.com/lookup’, or details such as the lowest fare available or the temperature at the destination. Abigail Comber, British Airways’ head of marketing, said: “This is a first, not just for British Airways but for UK advertising. We all know from conversations with friends and family that we wonder where the planes are going and dream of an amazing holiday or warm destination. The clever technology allows this advert to engage people there and then and answer that question for them. We hope it will create a real ‘wow’ and people will be reminded how amazing flying is and how accessible the world can be. The destinations can also be updated immediately depending on changing focus routes for the airline.